(June 20, 2018, Toronto, ON) Architects and EIFS industry professionals gathered on the night of June 13th in Toronto to recognize and celebrate the Finalists and Grand Prize Award Winners of the 2017‐18 ECC Architectural Design Awards. 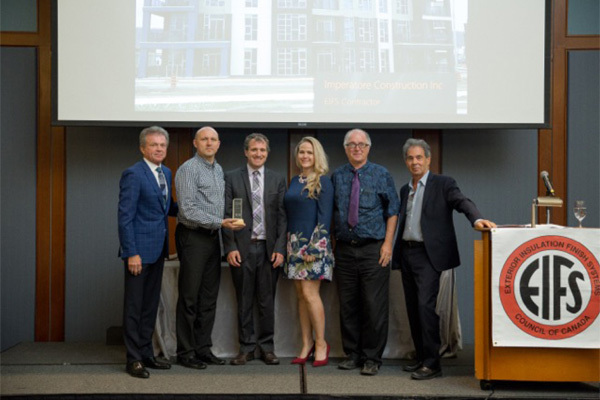 At the event, the EIFS Council of Canada (ECC) announced KNYMH Incorporated and their project AquaBlu Condominiums as the Grand Prize Award Winner from among the five finalists. The AquaBlu Condominiums and its design team was selected by the Judging Panel as the Grand Prize Winner from the five finalists. The project architect, Przemyslaw Myszkowski was present to accept the Award, along with other members of the KNYMH Incorporated team: Wayne Harrison, Marc Begin, Serina Carbone. The ECC Architectural Design Awards Program was established to recognize design professionals and firms which incorporate EIFS products into innovative and creative built projects. The goal of the ECC Awards Program is to create a new benchmark in EIFS construction, and will help professionals to achieve Canada’s national objective of creating resilient, sustainable buildings. The EIFS Council of Canada (ECC) was formed to represent the Canadian EIFS (Exterior Insulation and Finish Systems) industry across Canada and all its user sectors. The EIFS Council looks back over the industry’s 40‐year history in Canada to chart the course forward – advancing innovation balanced with preservation and supported by independent and government validation. The ECC serves as the “official voice” of the EIFS industry with a mandate to provide for the advancement and growth of the industry across the country, through advocacy, education and marketing.